1. 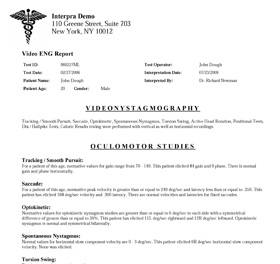 As a physician, why do I need a Videonystagmography (VNG) system and a Posturography/balance plate testing and treatment system? Until recently, most busy physician practices had very little to offer patients with complaints of dizziness, vertigo, disequilibrium and unsteady balance. 20th century medicine involved prescribing antihistamine medications such as Meclizine to treat vertiginous symptoms; however, these antiquated strategies provided no cures. 21st century advances in technology now allows any type of physician to easily assess these types of complaints. Differential diagnoses can be easily and accurately accomplished in-office and the patient can begin standardized treatment protocols immediately. 2. What is a Videonystagmography (VNG) device? 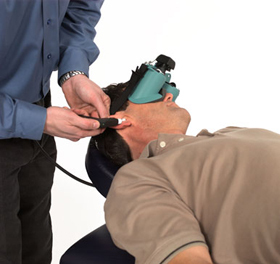 VNG is a non-invasive, non-pharmaceutical technology that provides an objective differential diagnosis of the cause of dizziness, vertigo, unsteadiness and other balance disorders using normative data. It assists the physician in differentiating between peripheral and central nervous system disorders which is crucial in determining the proper course of treatment. 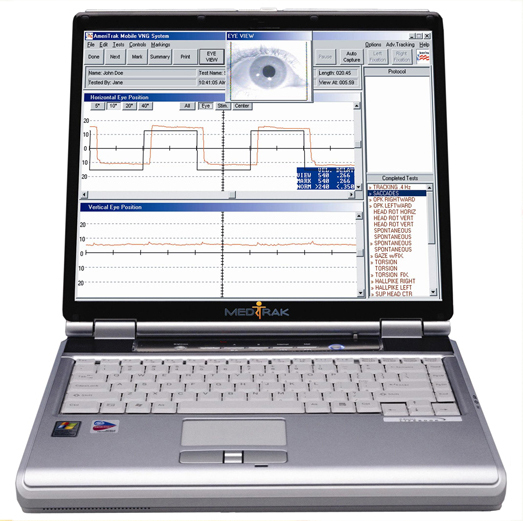 Patterns of eye movements are recorded and produce data which allows for specific pathology determinations. 3. What are some of the disorders & pathologies that will be diagnosed by VNG testing? 4. *Can VNG testing assist in diagnosing concussions/head trauma? Major institution are now producing studies showing the direct relationship between eye tracking (directly measure by VNG testing) and patients with head trauma/post concussion. MedTrak VNG is now in the process of assisting these institutions with these studies. 5. How long does a VNG test take to perform? The technical component of this test takes approximately 40 minutes with a cooperative patient. 6. Can the test be performed by a technician? 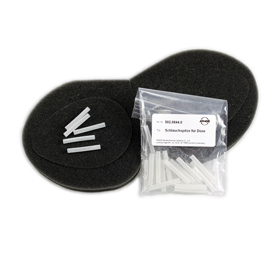 This test is considered general supervision (level 1) and is performed by a technician. General supervision means the procedure is furnished under the physician’s overall direction and control, but the presence of the physician is NOT required during the performance of the procedure. 7. Is VNG equipment mobile? Yes. MedTrak’s VNG equipment is easily moved from exam room to exam room or between multiple offices. In fact it was designed to be utilized by mobile testing services. 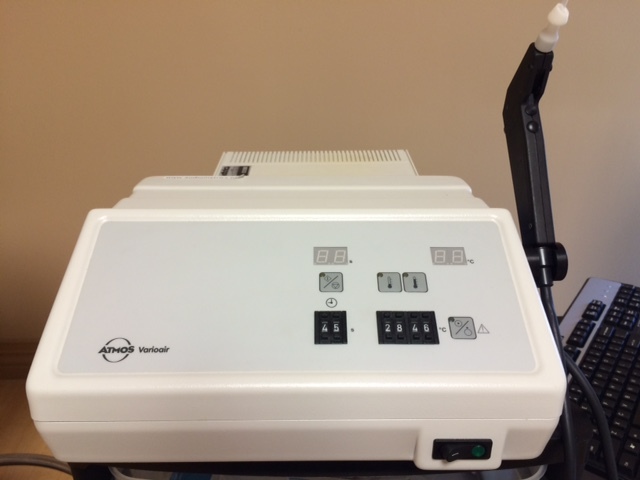 Medtrak VNG equipment does not use light bars or projectors. The patient's eye and all icons appear directly on the computer display. 8. How much space is required for VNG equipment? MedTrak’s VNG equipment requires a simple exam room with an exam table and swivel chair. This equipment does not require a dedicated room. The equipment can be stored on a cart and taken out for testing. 9. Are there any contraindications for performing a VNG test? There are very few contraindications for VNG testing. An example would be a patient with a torn tympanic membrane. Only a partial test could be performed since no caloric irrigation would be done for that ear. Another example would be a patient with one functioning eye. Only a partial test could be performed because this patient could not perform the oculomotor portion of the test. 10. Are there any side effects as the result of a VNG test? Short term: VNG testing intentionally induces a patient’s nystagmus and dizziness, therefore, on very rare occasions, a patient might become nauseous. Long term: There are none we are aware of. 11. What is posturography/balance plate (force plate) testing and treatment? Posturography/balance plate (force plate) testing is a physical performance test utilizing non-invasive, non-pharmaceutical technology in order to objectively assess a patient’s balance. All three systems of equilibrium (vision, vestibular and somatosensory) are measured and compared to age matched normative data. 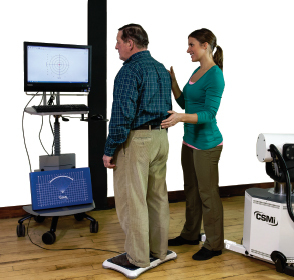 Utilizing the patient’s height and age, limits of stability and age-matched norms, the patient’s standing balance is then measured, recorded and compared while standing on a force plate with variable surfaces, eyes opened and closed, producing graphs and data from which the practitioner can analyze and determine the patient’s weakest balance systems and their risk for falling. This assists in determining the appropriate treatment plan and provides an objective baseline for measuring patient progress*. 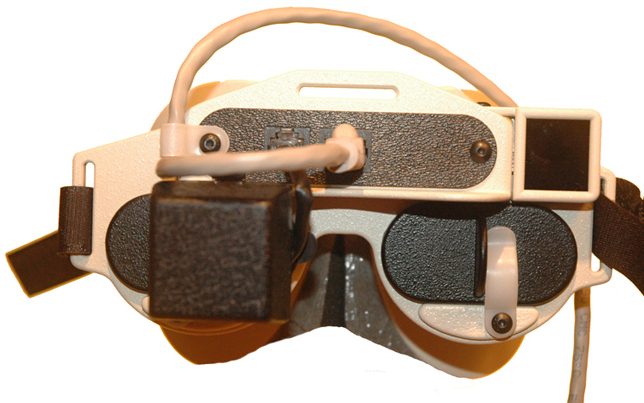 This testing equipment doubles as a treatment device by which the patient can be run through a battery of individualized treatment programs specifically designed and targeting the specific deficits and diagnoses made through VNG and balance plate test results. *Initial testing gives the practitioner baseline objective results for the patient's Limits of Stability and Clinical Sensory Integration & Balance. Follow up testing, following treatment protocols, can then be measured and compared to the baseline, in order to determine patient progress. 12. How long does a posturography/balance test take to perform? The technical component of a posturography test takes 10-15 minutes. 13. Can this test be performed by a technician? Yes. This test is considered level one supervision and is performed by a technician. 14. How long does balance and vestibular rehab/treatment typically take? Most rehabilitation/treatment sessions last between 30-60 minutes. 15. How much space is required for posturography equipment? Very little space is required and this equipment does not require a dedicated room. The equipment can be stored in a closet or on a cart and taken out for testing. 16. What insurances carriers reimburse for these tests? Medicare, Medicaid, private insurance carriers, workers comp and no-fault. We are unaware of any carriers that do not pay for vestibular studies (VNG) and/or balance testing and treatment. Each state and each carrier may have different reimbursement rates and policies, therefore, all physicians should check with their local carriers for rates, LCD’s and general policies. 17. What are the reimbursement codes and what is the approximate reimbursement? 18. Does the “benefit of owning” this equipment provide for additional sources of revenue? Yes. Some owners of VNG and posturography equipment rent their equipment on a daily rental basis, at fair market value, to other providers. Looking at standards and examples in the vestibular industry reveals typical daily rentals ranging from between $500-$1,000 for half day and full day rentals. Fair market value varies from state to state and should be verified by each equipment owner prior to beginning rental programs. 19. How do third party payors and the federal government feel about these tests? It has been well documented that third party payors, in general, are extremely interested in properly diagnosing and treating patients with dizziness, vertigo, disequilibrium and unsteady balance as it is a great cost savings for them in the long term. As far as the federal government is concerned, falls in the elderly are extremely costly and it is an exploding problem that must be contained. They encourage physicians to take up the challenge of providing proper diagnosis and care for these problems and, as such, have put forth several pieces of legislation regarding this matter. 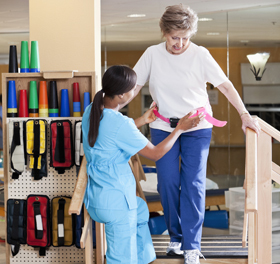 The “Keeping Senior Safe From Falls Acts” of 2004 and 2007, clearly address the need for appropriate testing and treatment measures utilizing 21st century technologies. 20. How are test results interpreted? Both the VNG and Posturography equipment produces a print out of graphs and numbers which can be interpreted by the referring physician. Posturography tests results are compared to aged matched normative data and produce instantaneous results which are quickly and easily interpreted. For VNG results, physicians can perform their own review or they have the option to have their VNG technician submit the test results ELECTRONICALLY, to InterpraTM . InterpraTM was designed to assist physicians in organizing their VNG data, as well as, assisting physicians with creating clear narrative reports. Additionally, physicians have the option to have a VNG interpretation expert assist them with their test result interpretations. 21. How will my staff be trained in the technical component of these tests? a) Two days of on-site in-person training by our installation and training staff. 22. How will the physicians be trained for the professional component of these tests? 23. When are the formal training courses given? Currently we have a live training course twice a year: March and October. 24. Is there training and support for my billing staff? Yes. We will provide your staff with a VNG Super-bill and the initial basics for billing vestibular and balance testing and treatment. Additionally, your billing staff can contact a billing company utilized for years by our distributors. They are completely familiar with this type of billing and are up to date on all pertinent information. 25. What kind of support exists for me, my staff and who ever treats my patients? We have four technical support lines, two on the west coast and two on the east coast available to take calls seven days a week. These lines are staffed by experts in their fields, including a board certified neurologist, a physical therapist, a computer/IT specialist and equipment engineers. These experts have been performing this type of support for more than a decade. 26. How long is the warranty? All quality engineered and manufactured products of the VNG and Posturography devices are warranted to be free from defects in materials and workmanship for one year from the date of purchase. 27. How are parts and services handled? MedTrak VNG, Inc. is regulated by the FDA and maintains a complete manufacturing and repair facility. It is able to handle any and all requests for parts and/or service. Additionally, many service and troubleshooting matters are usually easily accomplished by our technical support lines. 28. Does this equipment need calibration? No. Neither the VNG equipment or Posturography equipment ever needs calibration. 29. How long has this technology been around? Both VNG and Posturography testing has been around for more than a decade. 30. Is the VNG equipment regulated by the FDA? Yes. VNG equipment is considered a class 2 medical device and has a 510 k clearance by the US FDA. 31. Why MedTrak VNG and not one of its competitors? The president of MedTrak VNG, Inc. and it’s sister companies, Interpra, Inc., SCOTTPT.com and S & S Health Products, Inc., has been a clinician (PT) for about 30 years. It is our mission to provide practitioners with a comprehensive program and a complete continuum of care. Over the past decade plus, the MedTrak brand has provided US customers with thousands of reliable VNG and balance testing systems.